80m2 apartment located in Calella de Palafrugell, just 700m from the beach and the centre of town. It has 3 bedrooms (1 double bed, 3 single beds), a kitchen, a laundry room, 2 bathrooms (1 with a bath and one with a shower), a living-room (fireplace, TV, TDT, Hi-fi), and a terrace with stunning sea views. Within a community with a swimming pool and a tennis court. Garage. 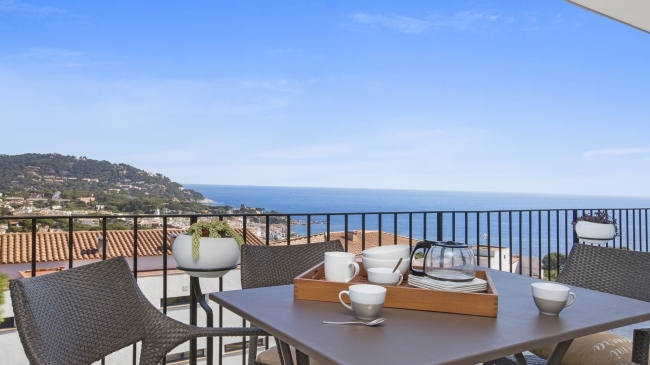 Modern and reformed apartment located in Calella de Palafrugell, 700m from the beach and the center. The spacious living and dining room leads to the terrace with lovely sea views. This apartment has 3 bedrooms: 2 bedrooms with 1 double bed each one and 1 bedroom with twin beds, open kitchen (oven, microwave, dishwasher), 1 bathroom with shower, 1 toilet and laundry with washing machine and dryer. Terrace with nice sea views. Communal swimming-pool, garden, tennis court and garage. 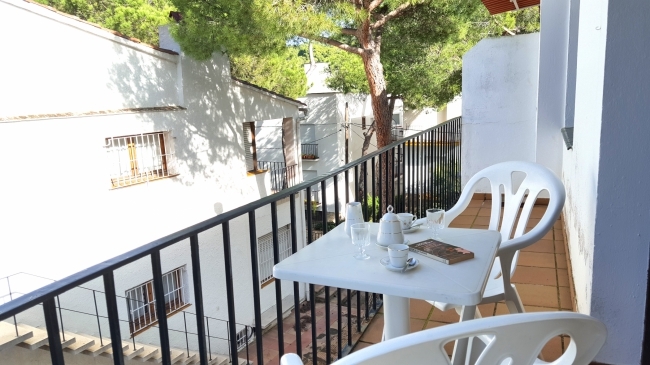 Apartment located in a beautiful residential area with gardens and communal swimming pool with sun chairs, in Calella de Palafrugell only 350 meters from the beach and the center of the city. It has 2 double rooms, 1 double bed and the other 2 single beds, a renovated kitchen (oven, microwave, fridge and nespresso machine), living room (TV, sofa and air conditioning included), 1 bathroom with shower and 1 toilet, garage and WIFI access included. Villa Rafael, is a nice and cozy house of 120m2 + 800m2 of plot, placed in a calm residencial area of Lloret de Mar (Lloret Residencial), to 8Km of his beach and of the center . The Villa is distributed in 2 plants; In the principal plant, we have a great lounge dining room (fireplace, tv satellite), totally equipped kitchen( dishwasher, microwave, vitroceramic cooktop, washer, tumble dryer), 1 room with double bed of 150x190cm and 1 bath with shower. In the top floor it's: 2 rooms with double bed (160x200;135x190cm) and 1 room with bed nest (2x 80x200cm; double bed), 1 bath with shower. 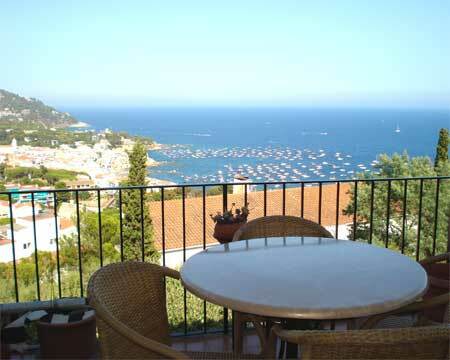 Also a nice terrace, where to be able to enjoy of wonderful views to the sea and to the mountain. Precious exterior zone, with swimming pool (8x4). Párking. Heating (all the house), 50€/week and air conditioning (in one of double rooms): 20€/week; All optional: The house has barbecue, but, for safety measures, is not possible use it. Very near to the house, there is a bus stop, with service there every 30 min, which leads to the Centre of Lloret de Mar. 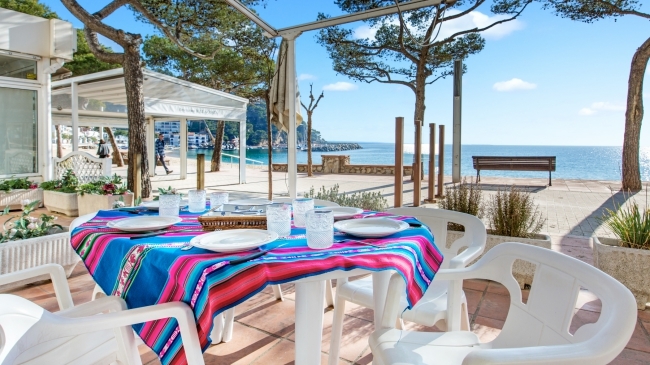 Reformed Apartment of 50 m2 located in Llafranc, 300 m from the beach and downtown. It has 2 bedrooms (1 double, 2 single beds), living room, kitchen (washing machine, oven, microwave), 1 bathroom (shower). Pets not allowed.